GatherContent is a tool that allows you to create, organise and collaborate on content. and inside a project you'll find the items. Items are the content pieces of a project, so your content will be written inside an item. 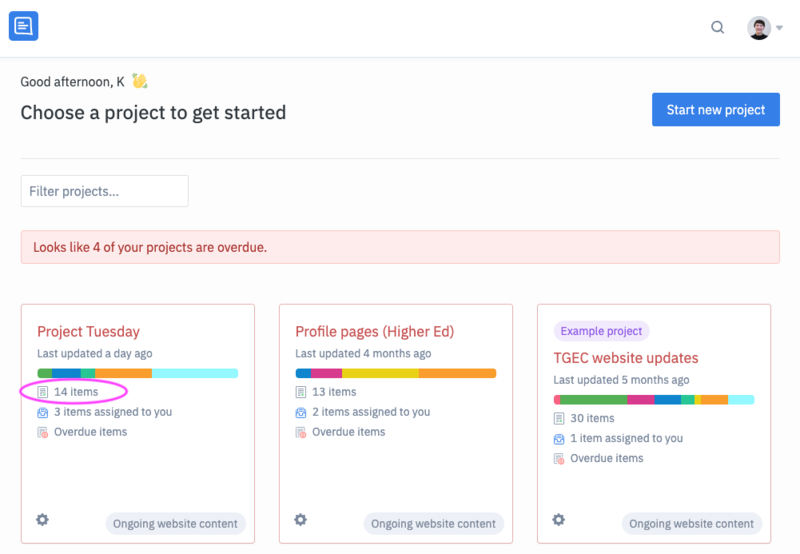 You'll find a project's content on the Content tab. Click an item's name to open it. If you want to go back to the Content list to open a different item, click theback arrow or the hamburger menu. You'll notice the page is laid out with different fields. Click inside a textfield and begin typing to write content. There may be handy hints in italic font just below the field, which help to guide you when writing. 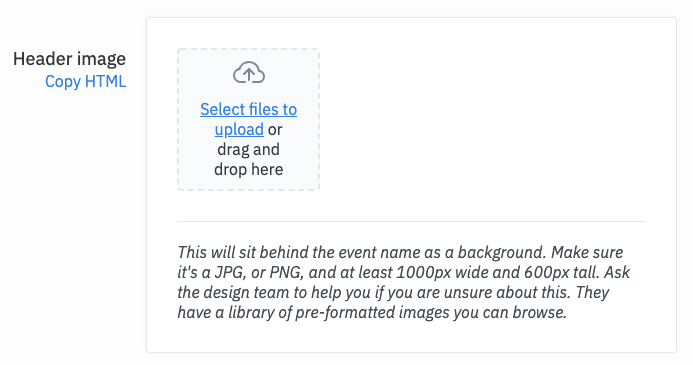 Click the link, navigate to the folder where your file is, or drag and drop it into the field to upload it. Tabs may also be used on items. Tabs allow information that's still related to be stored separately. For example, meta data may be collected on another tab in an item, or content translated into a different language. In an item, click another tab to open it. Type into any text field to add content. When you open an item, you'll always see tab 1first. Text formatting can only be added to existing text, so highlight some content to begin. You'll see a formatting bar pop-up with several options. Choose formatting to apply it to the content. To see apply different headings to text, click the A icon at the far left. Then choose your font style. 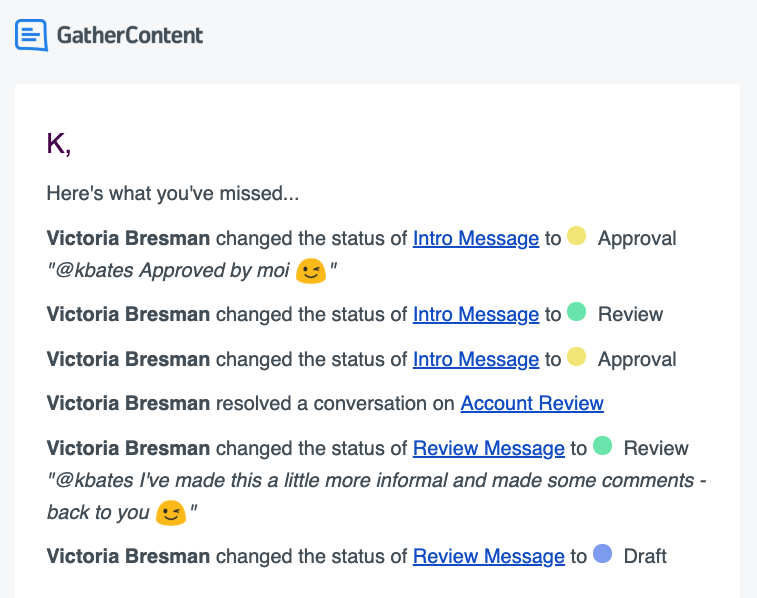 You're able to add comments to items and participate in open conversation threads with your team. To add a comment to some text, highlight it. At the right-hand side of the formatting bar that pops-up, you'll see a comment bubble. Click it, and begin typing your comment in the box. If you want to notify your colleagues of your comment, type the @ symbol on your keyboard, and then type your colleagues name. You should see a list of people you can choose from as you type. When you're ready, press 'Send' to finalise your comment. When you open an item, any open conversations will be shown on the right-hand side. Click a comment to open the conversation thread. You can add a reply in the box at the bottom, as above. Be sure to @mention any colleagues in your response, that you want to notify! If you're @mentioned in a comment, you'll see a summary of this in your emails titles 'Recent activity in GatherContent’. The workflow in the project describes the content journey, from being created to being published. It contains a group of statuses, which the content moves through while being worked on. Each item has a workflow status applied to it. Check it at the top of an item, to understand what needs to be done on the item and who needs to do it. 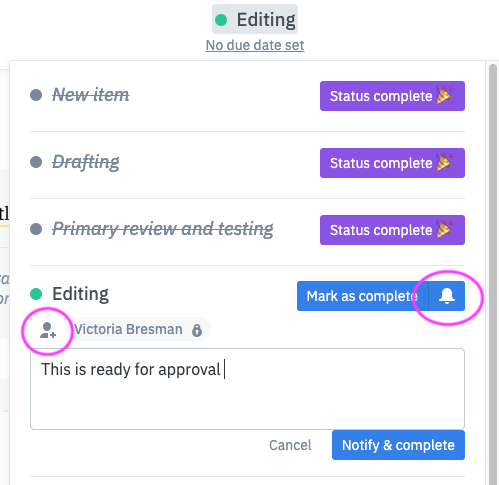 Once you've done your actions on a page, you may need to move it along in the workflow, to the next status. 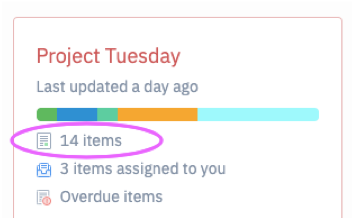 Click the current workflow status at the top of the item. 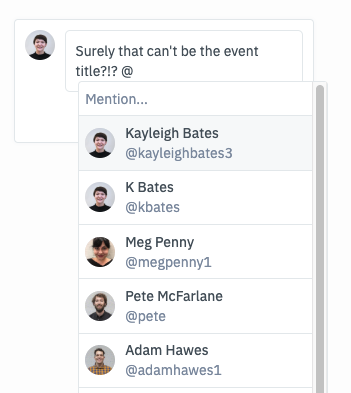 If you want to let your team know about the status change you're making, click the bell icon, and then the 'Add people' Icon to search for your colleagues. You can also write a message in the text box. Then click Notify and complete' against it, to move it onto the next status.